A row of glass tubes that each contain an absorber feeding into a manifold which transports the heated fluid. A well designed solar hot water system will provide up to 70% of your annual hot water demand, or make significant fuel savings for your home, business or swimming pool heating needs. Solar hot water systems are a well established, tried and tested technology that brings peace of mind. It does not require an inspection or service. 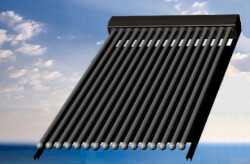 The NexusBS solar hot water system uses the energy of the sun to directly heat water. The process is very efficient, making it one of the most cost effective renewable energy sources for both domestic and commercial applications. 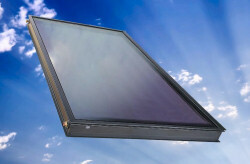 The energy is absorbed in the solar collector (panel) usually mounted on the roof. The heat is transferred to the hot water cylinder via heat exchangers. NexusBS solar hot water systems work in conjunction with an existing boiler but will do most of the work. The cylinder stores the hot water that is heated during the day ready to use when required. NexusBS supplies and installs solar hot water systems with options from a range of collectors (both flat plate and evacuated tube), a range of hot water cylinders (120L – 320L, pressurised or unpressurised), plus different installation options. This eliminates the need for all our customers to have several contractors on site, we will take the hassel out for you and complete the installation all in house. Generally evacuated tubes are slightly more efficient but many consumers prefer the aesthetic look of the flat plate. By offering both systems, NexusBS has the technical knowledge and the ability to select the best system for each installation. The NexusBS systems are all designed with both the customer and the installer in mind, every system is provided as a complete kit incorporating everything needed to complete each installation. The systems are generally relatively easy and fast to install. Solar thermal saves money too. The amount of savings that can be generated through the use of a heating system that does not create any on going expenses is absolutely tremendous. If you are spending £40-£65 on your heating bill every single month, you can easily save £480-£780 every year by installing a NexusBS solar panel heating system. Remember – domestic installations qualify for only 5% VAT!! !